Makruk is a living being in the Thai consciousness which continues to thrive and grow as the time passes. It is a chess game, or sort of a chess game, deriving its roots in the ancient Indian and Chinese chess games, for example Chaturanga. 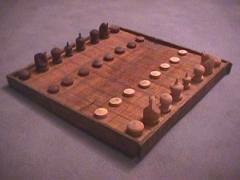 It is closer to the original constructs compared to the current international Western Chess. Everything that is loved in this world has certain deep rooted connections to the emotions present within the human mind and for the people in Thailand, Makruk holds a really loved and unique place. This form of chess is very popular among all types of people in Thailand, ranging from little six year olds to the very old ones. It's like a developed thought process and mental challenge and delight which lives in their heads. This chess is slightly different from the more known version of International chess in arrangements of pawns at the start and the movement of the queen which is only one step diagonally. Also any pawn reaching the sixth rank will always become a queen. So, there are these subtle differences in the rules and arrangements but what makes all that worth talking about is the passion of the Thai people for this game, which is like Sudoku in Japan. 'The more you play chess, the better you become at strategy', and the Thai consciousness goes through this more and more, every now and then, here and there. So, one can make a statement, 'Thai people practice strategic nerves through Makruk'. Genetically too it must be having a big imprint in their memories, as it's being played for over a thousand years now, at least. And that too perhaps, without any halt, as Thailand has been a free land since 1238 AD when it was founded. The best part is these strategies continue to evolve and the game continues to flourish, as it has an 'ego boost' factor associated with it. They have a concept of an associated honor with this game. You could be more honorable than the Queen of Thailand if you could beat her in Makruk but if you just want to be an equal, you can have a tie. The tie rules have more avenues and permutations compared to a tie in the international chess. Anything is valuable if it causes certain emotions, and for the Thai people, who play more chess than elsewhere, Makruk definitely has a place in their hearts.